As Halloween approaches, again comes the time of year for trick-or-treating, gorging on candy, and costume parties. It’s also the time of year that we are especially conscious of spooky things. Among various ghoulies like black cats, vampires, and witches, the most popular creatures of the night that dominate our imagination around Halloween are ghosts. It’s a great time for telling ghost stories, everyone knows at least one, and even Chatham has several that have been passed around over the years. Here is some history on “our” Chatham ghosts. 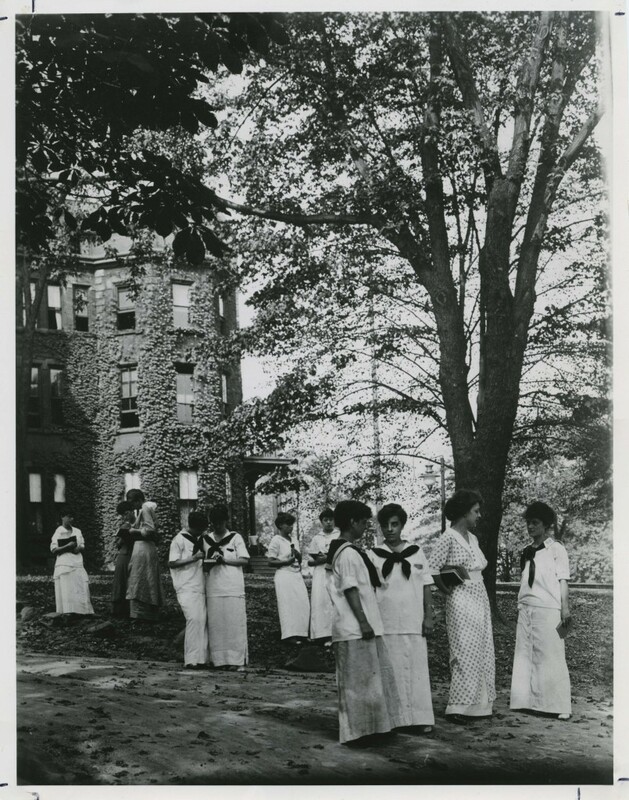 PCW students gathered on the lawn of Berry Hall I in 1914. There are two versions of the Berry Hall Ghost (also known as the PCW Ghost) story, but they both are equally disturbing. The first version was published in the Chatham newspaper, The Arrow in 1926. Back before the existence of Woodland, Laughlin, and even Dilworth Hall, the Berry family lived in the Berry mansion. George Berry was a member of the first Board of Trustees, and at the time his home was said to be the largest private residence in Allegheny County. One night the nanny was sitting in the house’s tower with the family baby. There was a storm, and lightning struck the tower. The nanny screamed with fright, and jumped, dropping the baby. As the story goes, the baby rolled down the stairs and died. The departed baby was said to return occasionally, floating around and crying. Supposedly it used to visit the girls in what was then Room O, directly beneath the tower. 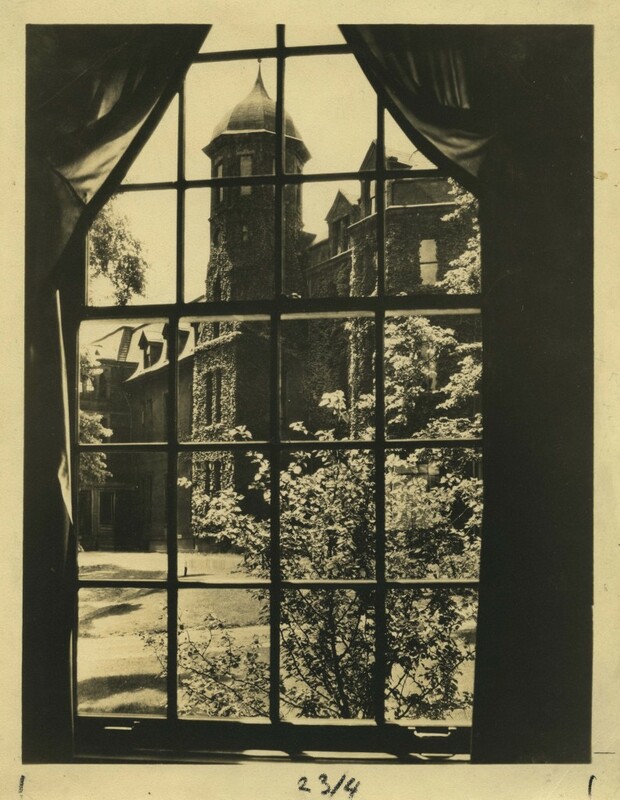 A view of the Berry Hall I tower. The second version of this story was actually part of the first year handbook in 1948. In this sanitized version, the nursery was in the tower, and the nanny heard a scream, only to find the infant missing from his crib. The infant was never found, and the tower was locked and boarded up. In this version, the ghost is a prankster, putting splinters in chairs to rip nylons, draining the soda machine, and clanging the radiators. There is even a joke about him playing a dirge on the organ. While creepy, this later tale is almost funny, and it’s interesting to see how the tale evolved from chilling to entertaining over the 20 year period. Some of the other Chatham ghosts seem to have their grounding in location rather than fright. It is still a popular tale today that Andrew Mellon roams the Mellon building. 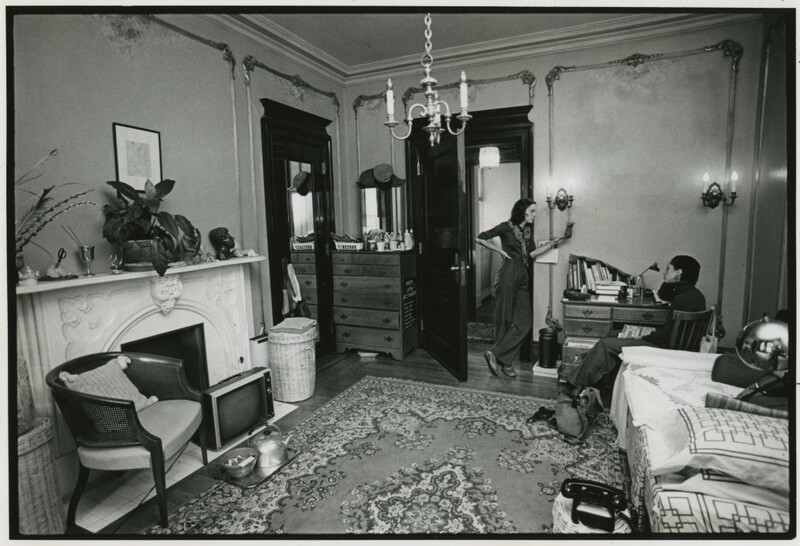 The previous Laughlin House also was known for its resident ghost. As another story goes, one night a man had a flat tire in front of the Spencer House, and as he stopped heard the voice of an old woman screaming his name. Portrait of Michael Late Benedum overlooking Benedum Hall. One of the more popular stories took place at Benedum Hall. 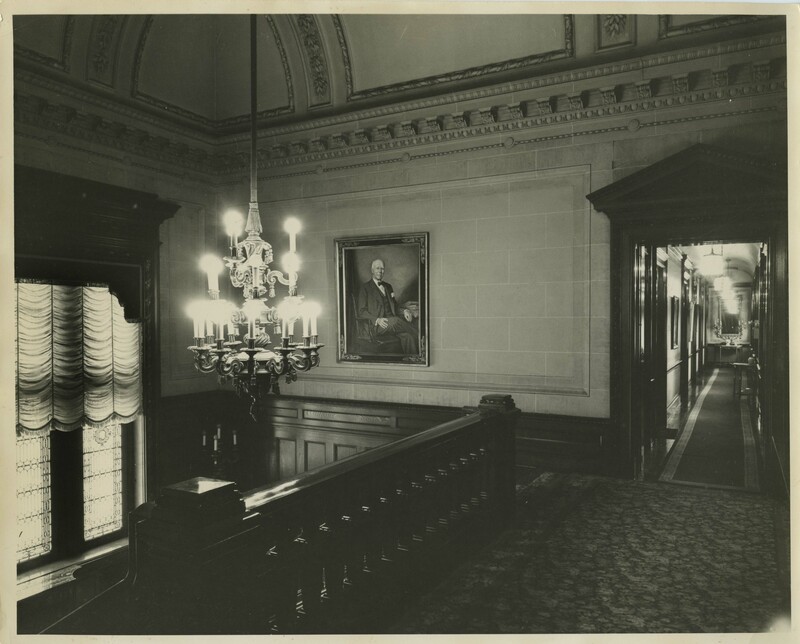 The Benedum’s oldest son, Claude, was killed in World War I. Claude was thought to haunt the home, and then when it became a dormitory, pestered the girls living in the dorm. Some of his hijinks include turning the water off and on in what used to be his bathroom, curtains moving with no wind, and doors slamming open and closed. Typical ghost fare. One story even goes that a group of students were working on tutorials on the history of Benedum Hall when the marble table they sat at collapsed beneath them. Students conversing in one of the Benedum Hall dorm rooms. It’s unclear which of these stories have basis in truth, and which were made up to scare incoming first years. Nonetheless, the stories of ghosts on campus continue, so if you experience something a little spooky over the next few weeks, don’t worry. It’s just our longstanding residents, coming out for a visit. 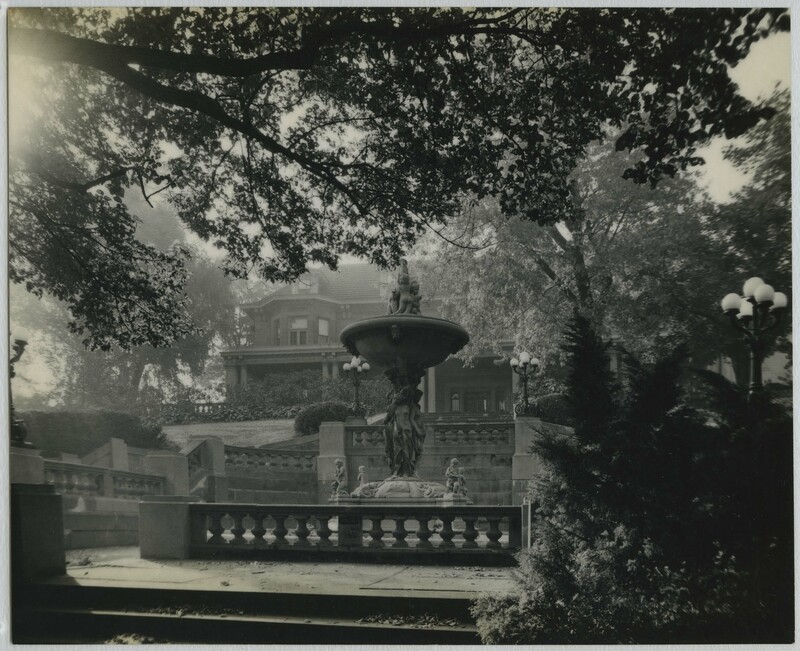 Benedum Hall Gardens and Fountain.